£1 Purple on Red paper. 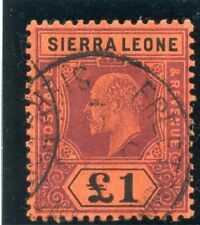 SIERRA LEONE King Edward VII 1908. Purple & Green. 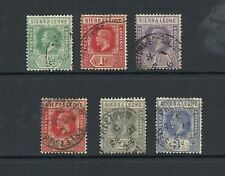 MINT Very Lightly Hinged - Full Original Gum. 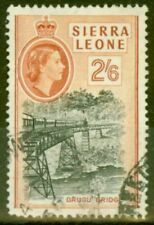 Catalogue Value £26 . 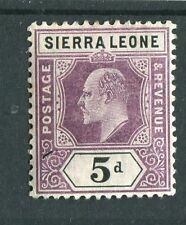 SIERRA LEONE. EDVII. PLYMOUTH PAQUEBOT CANCEL. 1/2d GREEN USED. 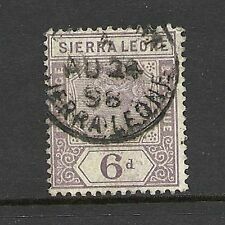 SIERRA LEONE. PLYMOUTH PAQUEBOT CANCEL. 1/2d GREEN USED. 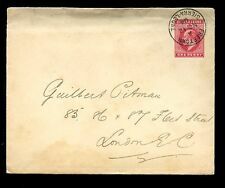 See scans - cut paper stamp - back thin where hinge removed - but still an interesting item. 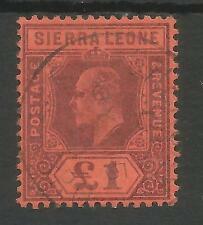 S Leone SG82,103 m/mint and 108 used.